CANTON, Ga. -- Cherokee Sheriff's deputies are searching for a man who they said stabbed his roommate multiple times. The crime happened Saturday morning in Canton. 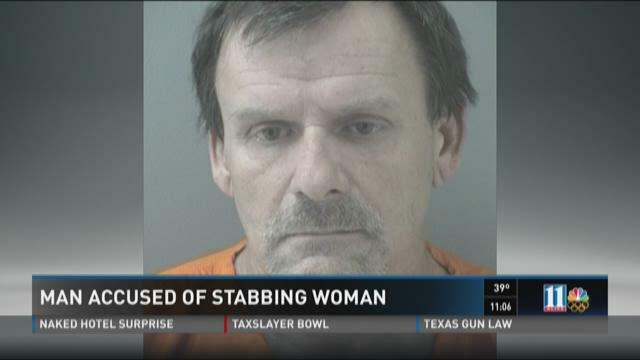 Deputies said 61-year-old Richard James Sheriff stabbed 45-year-old Claudia Santizo after an argument and then fled the scene. Santizon was wounded in her neck and arm. She was taken to Kennestone Hospital with non-life-threatening injuries. CANTON, Ga. -- An 87-year-old woman is lucky to be alive on Christmas Eve after her car left the highway and ended up in a flooded Cherokee County creek. Police say that Courtney and Craig Pitts pulled up to Canton Street in their Ford Mustang and started shooting at people. The bullets struck Gary Hart, 27, Chaz Hart, 25 and Jermain Gay, 39, who were all transported to local hospitals with apparent non life-threatening gunshot wounds to the face, knee and hip. Witnesses at the scene say the Pitts then drove away from the area in the same Ford Mustang. A Cherokee County Sheriff Deputy patrolling nearby spotted the suspect's car moments later on Lucky Street and attempted to pull the vehicle over, but it refused to stop. Authorities say after a short chase north on Highway 140 and down Pea Ridge Road, Courtney Pitts lost control of the car and struck a telephone pole. Both the driver and the passenger were injured in the accident and transported to Kennestone Hospital with non-life threatening injuries. CANTON, Ga. -- Friends and family said goodbye Monday to a U.S. Army lieutenant colonel who passed away while stationed in Seoul, South Korea. Lt. Col.
Richard "Billy" Maltbie, of Stockbridge, Ga., died after suffering a massive heart attack on Oct. 7, according to his family. It's believed to have been triggered by injuries he received from multiple road side bomb attacks while stationed in Iraq He was 39. Maltbie was a graduate of the University of North Georgia, the Naval Postgraduate School and Webster University. He served in Operation Iraqi Freedom, helping to secure northwestern Iraq. He was awarded the Bronze Star Medal, the Army Commendation Medal, the Joint Service Achievement Medal, the Joint Meritorious Unit Award and the Meritorious Unit Commendation. CHEROKEE COUNTY, Ga. -- The Cherokee County Sheriff's Office said that a missing man was found safe, Friday night. The department originally asked for the pubic's help finding 85-year-old Henry Jackson Gilman. Gilman went missing from a Walmart between Acworth and Woodstock. BOGOTA, Colombia (AP) -- The sole survivor of a plane crash in Colombia that killed two people during work on an upcoming Tom Cruise movie has been transferred to the U.S.
Jimmy Lee Garland, a pilot from near Atlanta, had been treated in Medellin for life-threatening injuries after being pulled from the wreckage of a twin-engine plane that crashed into the Andes nine days ago. The Georgia pilot had been working on the movie "Mena," which stars Cruise as real-life American pilot Barry Seal, who helped the CIA try to capture the late drug lord Pablo Escobar. BOGOTA, Colombia -- A Georgia pilot is the lone survivor after a plane crash that occurred on Saturday in Colombia and killed two. NBC News reports that the aircraft was assigned to the crew of a movie starring Tom Cruise currently named "Mena". Tom Cruise was not on the aircraft according to an official with the aviation agency who spoke on conditions of anonymity to NBC News. Garland was the only one to survive the crash but was rushed to a nearby hospital and was said to be in intensive care. Garland's son, Evan, told NBC that his father is in critical condition. He plans to travel to Colombia with his mother to visit him. NBC reports that Garland is a flight instructor and manager of a regional airport in Cherokee County.